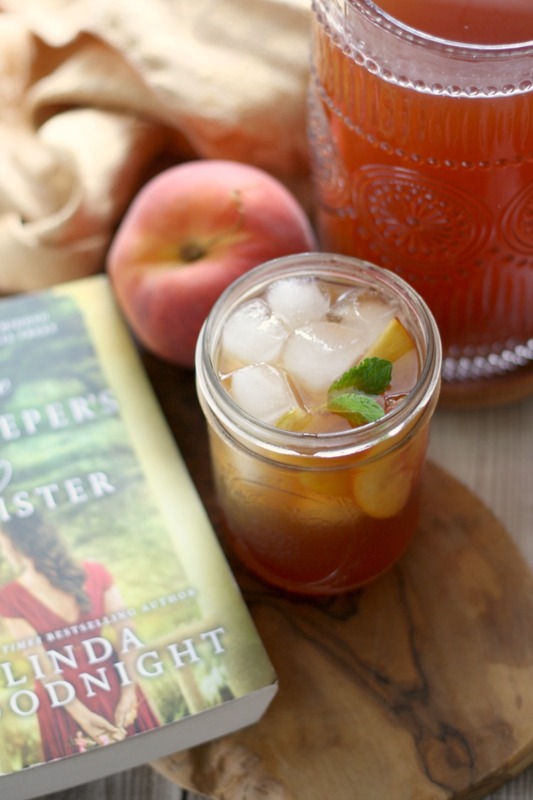 Welcome to the TLC Book Tours stop for The Innkeeper's Sister by Linda Goodnight! This is book 3 in Goodnight's Honeyridge Novels series, but the first (and only so far) one that I've read. I actually didn't even realize it was a part of a series until I'd finished it, which means it definitely works as a stand-alone book. When I went to look back at the descriptions for the first 2 books, they are connected by location (Honey Ridge, Tennessee), but focus on different main characters. Those characters also play a part in this book, so I'm looking forward to going back and reading their stories. 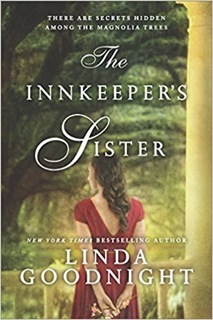 The Innkeeper's Sister centers around Valery Carter, co-owner of the Peach Orchard Inn (with her sister Julia, who seems to have been the focus in one of the earlier books), a former dancer with a painful past that is eating her up inside, and Grayson Blake, one half of the Blake Brothers, who buy historical buildings and turn them into restaurants. Having crossed paths when they were kids with hidden crushes, they've found themselves drawn together as adults. When human bones are uncovered in the basement of the old mill, once part of the same property as the Peach Orchard Inn, we are thrown into the late 1800's, shortly after the end of the Civil War, and a search to learn the history of the land these two families are now a part of. Little did they know that uncovering the secrets of the past would shape their future. Aside from some historical fiction, this is a love story, which at times I found a bit annoying, as I always do with the overuse of he/she won't love me because... and similar sentiments. That said, I still really enjoyed seeing the mystery unfold and the relationship bloom. I was really looking forward to another book (before I even knew this was already a series), but now I'm thinking that the next book may not even be focused on these same characters and their story. However, it still might be interesting to see them as supporting cast. It does make me wonder who the "stars" will be, though! While I wouldn't consider this a "foodie novel", there's enough food to set mouth to waterin' on the pages. I'm a sucker for both Southern food and comfort food (which were the main types of food mentioned), and found my mouth watering over mentions of fried chicken, biscuits 'n gravy, beet pickles, turnips and ham, apple dumplings, BLTs, and chicken salad on buttery croissants. Not to mention peach cobbler and the thing mentioned most—Peach Tea, an inn specialty (thanks to Julia). 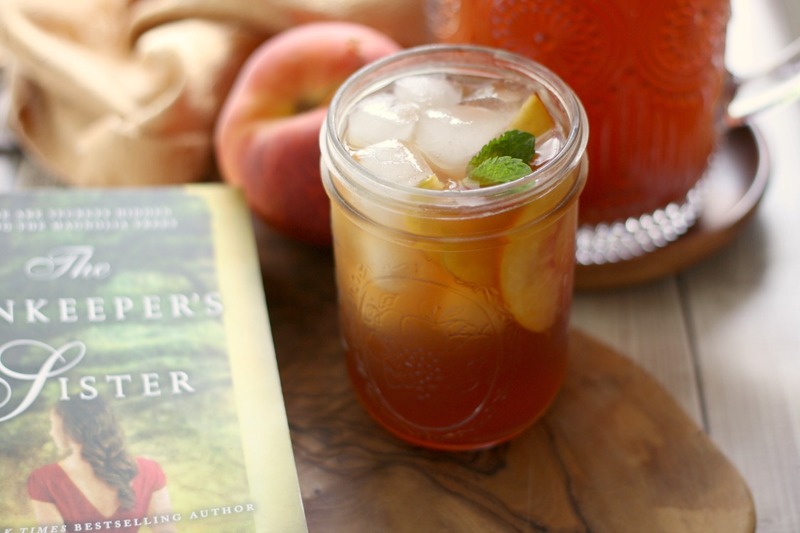 My Peach Iced Tea is absolutely delicious as written in the recipe below. It's not overly sweet, because I don't like it to be cloying, but it's definitely sweet enough (of course, I'm not actually from the south, so sweet tea diehards may disagree). While I didn't mention it earlier, Valery has a problem with alcohol, so while I wouldn't recommend it to her, I will recommend adding a tipple of bourbon to your glass if you want to booze it up a bit. It's delicious either way. 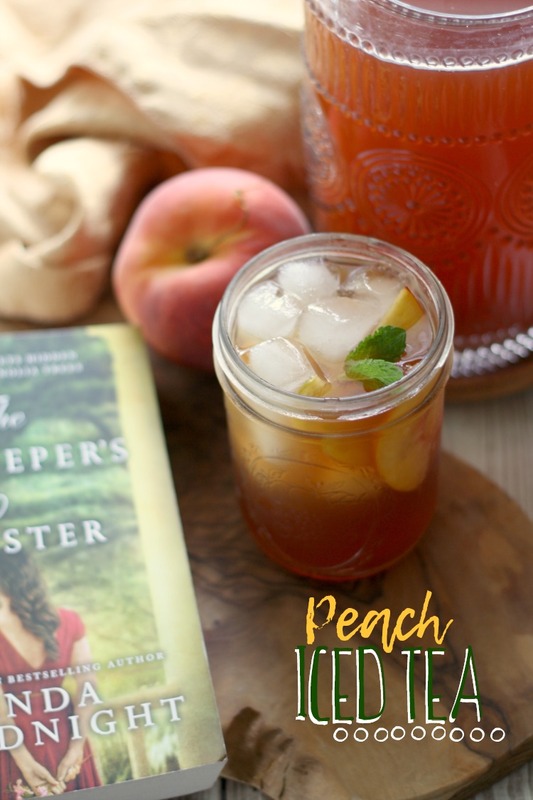 She poured a glass of peach tea, a pitiful substitute for mind-numbing bourbon, but after the other night, she'd sworn off. Again. "foodie" read: No...although I did have a hankerin' for peaches (and Southern food) something fierce by the time I finished reading. opening sentence: Secrets are like boils. 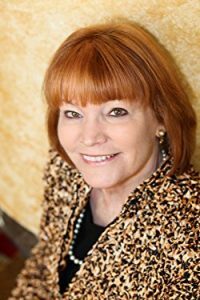 about the author: NY Times and USA Bestseller, Linda Goodnight writes novels to touch the heart as well as to entertain. Her emotional stories of hope have won the RITA, the Carol, the Reviewer’s Choice, and numerous other industry awards. A small town girl, Linda remains close to her roots, making her home in rural Oklahoma. She and husband have a blended family of eight, including two teenagers recently adopted from Ukraine. Many of her books are about family and children and rightly so, as she draws her deeply emotional stories from her surroundings, her great love of family, and from personal experiences as a nurse and teacher. 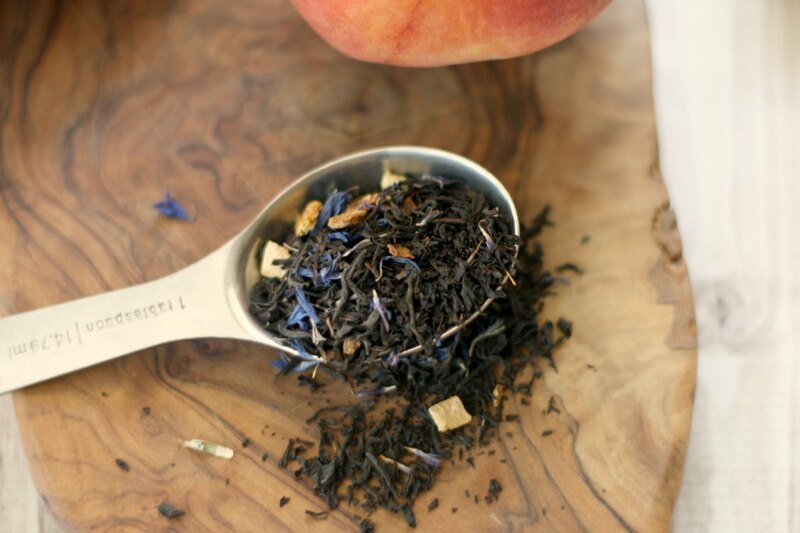 Easy homemade peach-infused simple syrup turns freshly brewed black tea into a the perfect summer sipper. Combine peaches, lemon zest, sugar, and water in a small pot and bring to a bowl. 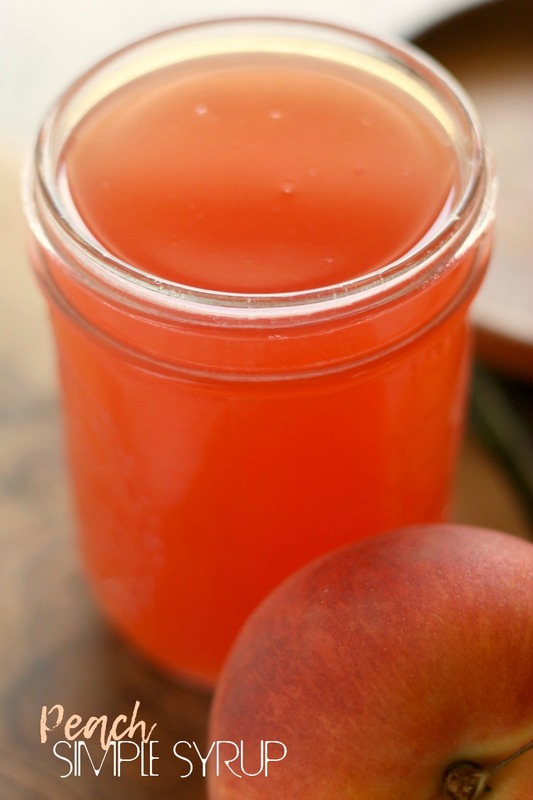 Lower heat to a simmer for 2 minutes, crushing the peaches to release their juices. Remove from heat and allow to steep for 30 minutes. In a large pot, bring the water to just under a boil (about 190° F), then remove it from the heat and add the tea. Let steep for 5 minutes. Strain loose tea with a fine-mesh strainer* (or remove the tea bags). Let cool to room temperature. Transfer to a pitcher, stirring in the peach simple syrup. Refrigerate until very cold. 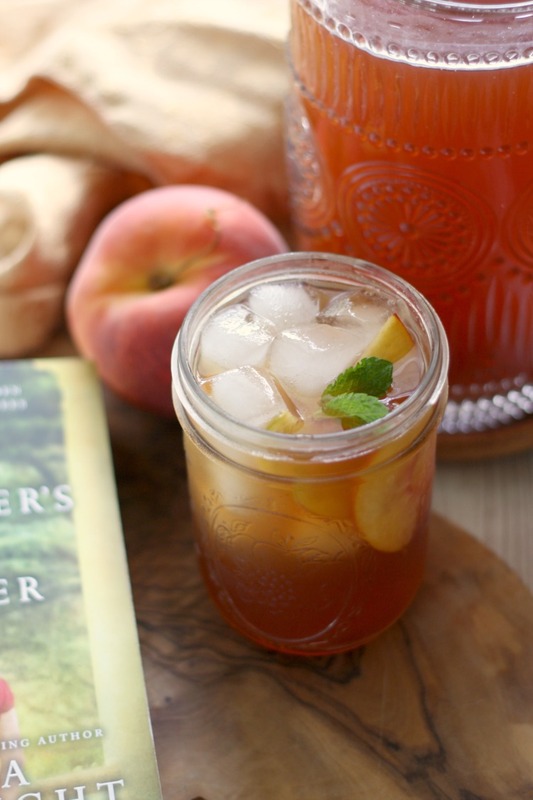 Serve over ice with a sprig of fresh mint and a couple slices or chunks of fresh peach, if you like. *If you don't have a fine-mesh strainer, you can line a medium or large mesh one with a coffee filter.